Complementing Dry Hill Trails in Arcadia Dunes-C.S. Mott Nature Preserve and sharing the same trailhead is Camp Trails. Dry Hill, a nearly 10-mile loop, was designed by mountain bikers as an intermediate run of quick rolling hills and numerous long uphill sections. In contrast, Camp Trails is a ride of only 3.7 miles and is laid out over fairly level terrain, making it much more appealing to those just getting into off-road cycling. Both are multi-use trails enjoyed by hikers much of the year and snowshoers in the winter. 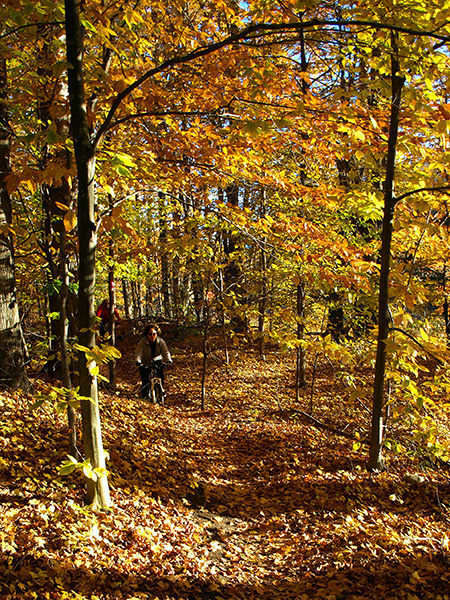 Today, Camp Arcadia is owned by the Lutheran Camp Association and offers a wide range of activities from spring through fall, including mountain biking outings in Arcadia Dunes-C.S. Mott Nature Preserve, just 3 miles away. The 3.7-mile ride is an easy, non-technical outing through forests, open fields and old orchards but includes backtracking between the trailhead and a small loop. You can avoid doubling back through Abby’s Woods and shortening the ride to 3 miles by following St. Pierre Road for a quarter mile back to the trailhead at the end. There are no facilities at the trailhead other than an information kiosk. Camp Trails departs from the parking area as a winding single track, quickly crossing Matzinger Road before running parallel to an old farm lane, one of many crisscrossing the area. 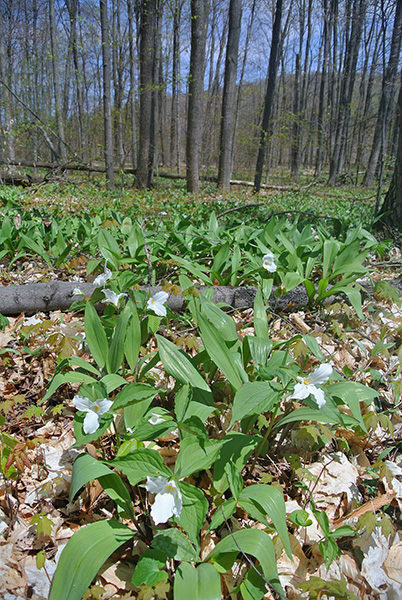 The trail is just inside a second-growth forest and skirts what used to be farm fields. At Mile 0.3 you cross the two-track and the field to enter Abby’s Woods. Abby’s Woods is a more mature forest with a slightly rolling terrain. In the spring the wildflowers are prolific. You break out of the trees to cross St. Pierre Road at post B, and cross another field to re-enter the woods, reaching Post C. This post, reached at Mile 1.1, marks the junction with the return trail. Take the fork to the right and within a third of a mile you’ll be weaving through a forest on the edge of another former farm field, now an open meadow. 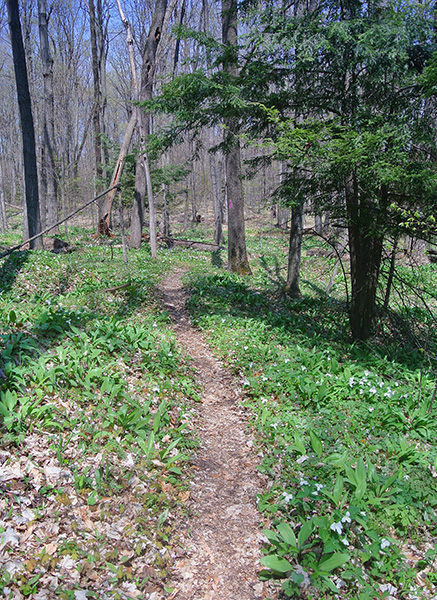 The trail is just inside the trees as the meadow remains in view for more than a half mile. At Mile 2, you cross another two-track and arrive at post D just to the north of Taylor Road. The trail skirts one more large meadow before entering the woods and arriving at post C at Mile 2.6. It’s less than a quarter mile to St. Pierre Road, where you either backtrack through Abby’s Woods for a 3.7-mile outing or head north on the dirt road to reach the trailhead within minutes. There are no facilities at the trailhead other than parking and an information kiosk. Camp Trails begins at the St. Pierre Trailhead, as does Dry Hill Trails, 8 miles south of Elberta or 2.7 miles north of Arcadia. The trail is posted on the east side of M-22, a quarter mile south of Joyfield Road with trailhead parking located 100 yards south along St. Pierre Road, a gravel road. For more information, contact the Grand Traverse Regional Land Conservancy at (231-929-7911; www.gtrlc.org).